On February 1, 2017, in honor of Black History Month, Google featured sculptor Edmonia Lewis with a Google Doodle. 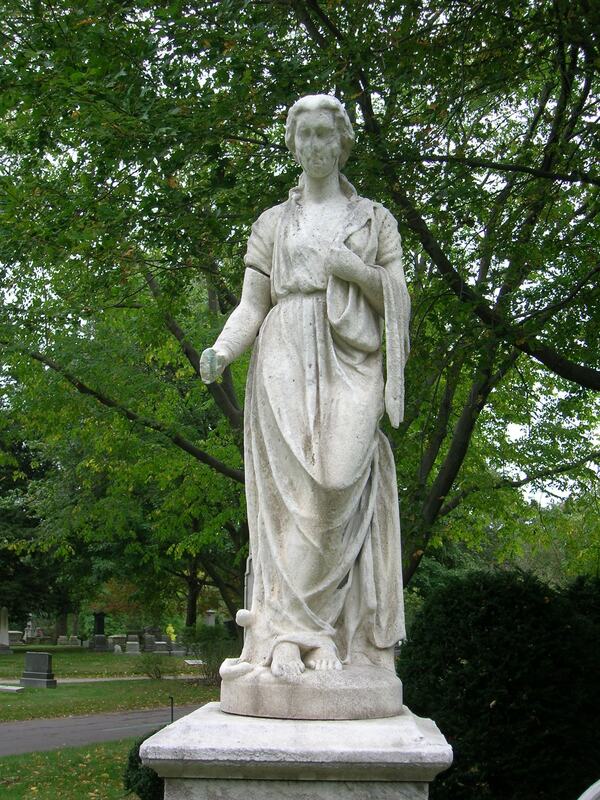 Lewis’ work is a highlight of Mount Auburn’s Significant Monument Collection with her 1872 marble sculpture of the Goddess of Health and Hygiene, Hygeia, commissioned by pioneering female physician and reformer Harriot Kezia Hunt for her family’s Lot 2630 Poplar Avenue. 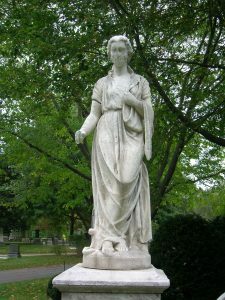 Historian Marilyn Richardson wrote, “The doctor and the sculptor chose to introduce a woman of ancient power and authority into Mount Auburn’s landscapes of influence, a woman who, in a place of loss and bereavement, they posed striding forth with the attributes of wisdom and well-being.” Richardson, a foremost scholar of Edmonia Lewis, recently shared her decades of research and discovery about Lewis with Mount Auburn’s artist-in-residence Roberto Mighty for his multimedia earth.sky project. For the 5-minute piece, Mighty filmed sculptors Fern Cunningham-Terry and Karen Eutemey as Lewis’ dreamlike ‘artist hands.’ Actor Dayenne C. Walters voiced Edmonia Lewis’ words in Mighty’s studio, and Actor Souther did the voices of Lydia Maria Child and Anna Quincy Waterston. earth.sky 2016: “An American in Rome” from Roberto Mighty on Vimeo. Beautiful, moving, necessary. Thank you! Thank you. I especially appreciate learning something new and significant in Black History Month this year, after the so-called president’s display of ignorance and indifference. Thanks to Mount Auburn for this bit about Lewis. It was very nice. I also appreciate learning something new during Black History month, but unlike some, I think that our “so-called” president might just be displaying some courage and wisdom… I didn’t vote for him myself, but I’m trying to keep an open mind. This piqued my interest – will definitely buy the book to learn more about her, especially during these fragile times where history and women have so much to lose. Congratulations on a terrific piece and a wonderful way to celebrate Black History Month. Thank you!